The tar sand fields of Alberta, Canada is the third largest bitumen deposit in the world. 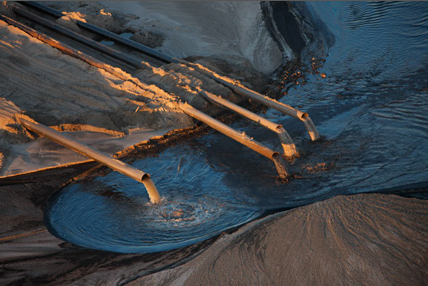 Tar sands are a combination of clay, water, and bitumen, a heavy black toxic oil. The tar sands are being mined and processed to extract bitumen, which is then refined into oil. This particular tar sand deposit cannot be pumped from the ground, so it has to be extracted via mining. Recently, prices for crude oil have begun to rise, making tar sands production in the United States commercially sought after. Getting to this 2 trillion barrels of oil will mean destroying an area larger than the state of Alabama. Tar sands oil is considered one of the worst types of oil pollution for the environment and climate. Alone, it creates three times the greenhouse gas of conventional oil production. Why is this? It is due to the amount of energy taken to extract and process this tar sand. Across the United States, oil refineries are expanding their facilities to process this heavy toxic oil from the tar sands. These emissions have been linked to respiratory sickness, asthma, and even cancer. Environmentally, the tar sand yield is horrendous. Moving companies extract and dump four tons of soil for every one barrel of oil. This means destroying massive plots of land for small oil yield. Extracting all this ground to gain access to the tar sands requires a massive amount of water. In order to extract one barrel of oil, it takes an average of about three barrels of water. Almost 90 percent of this water, which accounts to about 400 million gallons per day, ends up as toxic waste. This is then dumped into massive pools containing numerous harmful toxins.